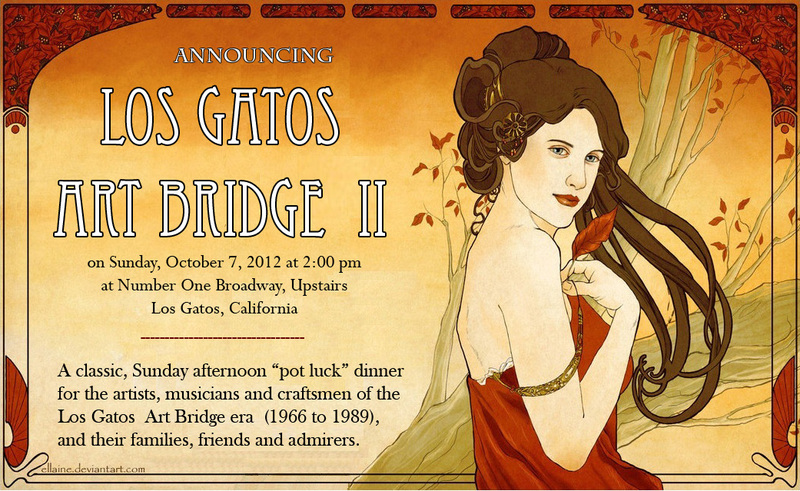 The Los Gatos Art Bridge II was a victim of poor planning. We really didn’t take into account San Francisco’s Fleet Week activities (notably, the Blue Angels and the mini-America’s cup) and the many local activities, such as the fair at St. Mary’s, that were held at the same time as Art Bridge pot-luck. While the primary purpose for convening Art Bridge I and Art Bridge II was to gather together artists, craftsmen and any interested parties who were active in the refurbishment and beautification of Los Gatos during what we call the “Art Bridge era,” (from the early 1960s through the Loma Prieta Quake of 1989, or thereabouts). Art Bridge II, held at Number One Broadway last Sunday, was fairly successful in fulfilling this purpose as we attracted and engaged a significant number of artists from the era. However, the secondary goal of informing the more recent Los Gatos residents and town officials about Art Bridge activities achieved a pretty meager showing We did get several local non-artists to stop by and they were all surprised at what they didn’t know about the town’s recent history. That was gratifying. At least we made the point and they got it. That made us feel that we are on the right track. Our message seems clear enough, we just have to get it in front of more people. When we started Art Bridge, we felt that first thing to do was to build an accurate and complete time-line, who did what, and when, in the Art Bridge era. Initially, we did this just from our own memories, an unreliable and questionable source of information, admittedly. Using these memories, we proceeded to the published records of the time at the Los Gatos Library, a collection they call “Hooked on Los Gatos.” Just as a sculptor will build an “armature” out of wire or wood to support the clay, which is applied to the armature, to be molded into the final form, we wanted our time line to be as accurate and solid as possible. We were going to be collecting the stories and tales of the Art Bridge era, coming from many rusty, old and fuzzy memories from many very silver topped brains. When we asked the volunteers who operate the Taste of Los Gatos what sorts of materials they had regarding the Art Bridge times, they told us, quite simply, “Not Much.” The Los Gatos library accumulated it’s large historical collection because when residents would die, the families of the dearly departed would sort through memorabilia, keeping what they wanted and then donating the remainder to the town library. The library has tons of history stuff, but as the Art Bridge era people are only now starting to “pass on,” as it were, there hasn’t been much for the families to sift through and donate. The one thing the volunteers did have were directories, phone books and newspapers from the Art Bridge era. From those, we were able to start building the “armature” for Art Bridge, a fairly accurate and reliable time line (see attachment “Old Town Time-line” and “LG General Time-line”). This “lack” of material actually was a double edged sword, we“LG General Time-line” all thought. If the target group is still alive and active, using modern technology, we could reproduce materials they still wanted to hang on to, but we actually had the owner, in the flesh, still alive and kicking and able to provide us with even more information and background than a deceased provider, obviously, ever could. In this way, the historical record about the Art Bridge era would be even more reliable and accurate than any of the other collections which the library possessed. And it might set a precedent for future generations. This seemed like a win-win for all involved. We would be collecting stuff the library didn’t have yet, along with the stuff’s living owner and we would be attracting more attention, and hopefully, more material for our efforts. It began to look like we could evolve into a collaboration between the library, the museums of Los Gatos and the Art Bridge, each helping to support the other. But that seems not to be the case. During the process of building the time-line, the “Hooked on Los Gatos” volunteers informed us that we being un-invited from collaborating with them by the library’s management. Building the armature, and completing it, was pretty much stopped dead in its tracks. We turned our efforts to trying to get our compatriots to dig through their attics and basements, finding what memorabilia they could, to help build up our own archives. Though it is not unlike pulling teeth, we have been fairly successful with this. Over the next few days, after last Sunday’s Art Bridge II, the artists who attended were coming up to us in the street or at our coffee house tables and handing us little slips of paper or sending us emails, telling us to add Joe Blow or Suzy Somebody to our lists and check this out and check that out from those old days. Their memories were jogged out of inertness and their interest rekindled. This was the success of Art Bridge II. The guys are interested and involved. One of them sat down and lectured me on how important history is, how a good future is built on a solid understanding of the past’s achievements and failures, and how important it was to get it right, like I had done with the spread sheets. I was chuckling as he spoke, so many people tell me that archiving this history isn’t that important at all, who really cares, why waste the time, get with it, live in the future? The reality learned last week from Art Bridge II is that this stuff is a hell of a lot of work. The reality is that Art Bridge needs some real support and some real exposure, to expand the support. We made a promise to ourselves that after last Sunday, our efforts would turn from book selling to earnestly market Art Bridge, itself, and the Art Bridge Blog, to seek and find support and sponsorship. Enough people told us to keep up the good work that we decided we will. However, these folks were town residents, not town staffers or officials. When library management uninvited us from the involvement with its volunteers, no effort was made to determine the goals, resources or intentions of Art Bridge. Even though we did support the volunteers efforts by sharing memories, materials and research efforts with Hooked on Los Gatos, library management had no interest what so ever in our efforts or plans. We calmly complied, even for the loss of necessary resources. What was very bothersome to us, though, was that “grass root”community efforts, of a completely volunteer nature, was so arbitrarily stifled by a town employee who doesn’t even live here. Such an employee may have a job here today and a job in another town in one year or five years but the real question is “is that person ultimately invested in the Los Gatos community or the success of his job?” One has to wonder, how can a town official be considered a supporter of community efforts when they make uninformed and arbitrary, indeed, high handed judgments when they have never even bothered to speak with the developers of the community projects? If our good intentions are somehow counter productive to other history or library efforts, at least let us know how and why so, perhaps, we can make adjustments to be more compliant to these pre-existing efforts. Don’t simply leave us in a vacuum of non-support and silence. In fact, over the last couple of years, I’ve heard tell of machinations and ministrations by town staffers that are used to help business interests avoid complying with the Los Gatos Town General Plan. As I was told, a document written by community members, not so much town staffers, to guide the growth and development of the town as the community desires, not staff. If I got this information wrong, I’m open to being educated, but again, for the most part, staff isn’t very forthcoming with information or the desire to communicate. Perhaps, if town staff and newer residents were to check out some of the Art Bridge stuff, they might see where the people who wrote the town’s general plan were coming from and learn why they feel the way that they do. « Los Gatos, 1980 — What is a Pyramid Party?